Year of the Labbit: Thith Fountain'th The Besssth! 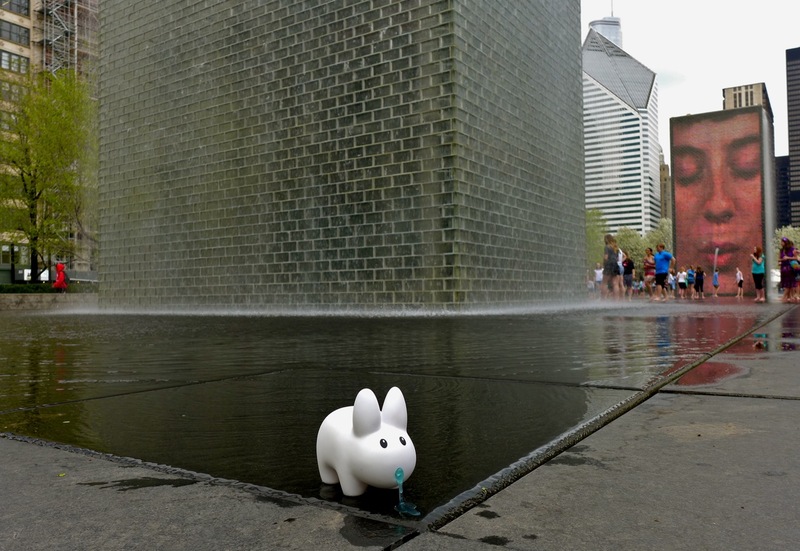 Pipkin's hope for a grassy spot to nap was a bust, but continuing his hop south in Millennium Park he came across Crown Fountain, which, in his opinion, is the best fountain ever! Two 50 foot (15 m) tall glass brick towers oppose one another across a shallow granite pool. Images of Chicago residents are displayed on LED screens while water pours over the structure. After a few moments, the faces begin spitting out a stream of water! Pipkin loves art that is accessible, that fits in with its surroundings and is interactive and fun, and he enjoyed seeing diversity in the faces of Chicago. This place isn't just great on a hot summer day for splashing around, but it's a lot of fun for people watching! Tourists will walk by and stand in front of the towers to take photos, unaware that they are about to get a soaking. It's fun to people watch and watch the people watching other people. Most fountains you can't even splash around in. The fountain is surrounded by benches for tired parents to sit on while their kids run around burning off some energy. Juame Plensa did a fantastic job designing this fountain, and the city park provided a wonderful place for people to enjoy Chicago. Well done! Crown Fountain is located in Millennium Park between Cloud Gate and the Art Institute of Chicago. The fountain runs, weather permitting, from May to October.